The EPA rule requires contractors to use “lead-safe” practices when working on homes, day-care centers and schools built before 1978, the year lead paint was banned for residential use because of health risks. This 8 hour course trains renovation, repair and painting contractors how to work safely in housing with lead-based paint and comply with EPA’s renovation, repair and painting (RRP) rule and HUD’s lead safe housing rule. Includes health concerns, regulations, before, during and after work procedures, record keeping and training non certified workers. This training is required for any contractors who is involved in any construction activity that will or has the potential to contact lead based paint. In 2008, the Environmental Protection Agency issued a new rule under the Toxic Substances Control Act regarding “lead-based paint hazards created by renovation, repair, and painting activities that disturb lead-based paint in target housing and child-occupied facilities.” The rule, which has an effective date of April 2010, directly affects general and specialty contractors by requiring them to be certified if they are performing work on a targeted facility and to provide warnings to let people know of the hazards. The rule generally applies to renovation of any housing constructed prior to 1978 and any public or commercial facility constructed prior to 1978 where children are present on a regular basis, such as a day care center or school. Exemptions include minor repair or maintenance work involving an area no larger than 6 sq. ft. of interior painted surface (20 sq. ft. for exterior), renovations by an owner to their own residence or a certification that the work area is free of lead-based paint. What is the contractor required to do? 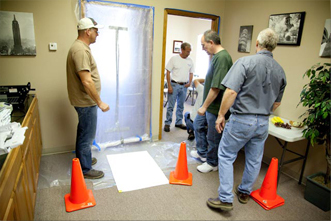 The rule requires that anyone doing renovation on targeted facilities obtain certification that evidences they are trained in the use of lead safe work practices and that they will follow specific work practices when performing the renovation. What this means to you is: (a) your company must receive certification, (b) a certified renovator must be assigned to each renovation of a covered facility; (c) all persons performing work on the project must receive on-the-job training by a certified renovator; (d) all renovations must be performed in accordance with the EPA work practice standards related to lead-based paint; (e) you must provide the owner and occupants of the property with an EPA pamphlet advising them of the lead hazards associated with renovation and obtain a signed certificate of receipt; and (f) you must keep records of compliance on all projects.